CONSHOHOCKEN, PA--(Marketwire - Sep 11, 2012) - AlliedBarton Security Services, www.alliedbarton.com, the industry's premier provider of highly trained security personnel, is pleased to announce that the company's President and CEO, Bill Whitmore, has received the 2012 Edgar B. Watson Award from the Board of Directors of the National Association of Security Companies (NASCO). The award was presented at NASCO's Annual Breakfast meeting during the ASIS Annual Seminar and Exhibits in Philadelphia on September 11, 2012, at the Marriot Philadelphia City Center. "NASCO is proud to honor Mr. Whitmore's contributions to the private security industry with the Edgar B. Watson award," said Jeff Flint, Executive Director, NASCO. "This industry continues to grow and advance thanks to the leadership of individuals such as Mr. Whitmore who have dedicated their careers to ensuring that business and communities are supported by well-trained security teams." Driven by Whitmore's vision and leadership, AlliedBarton has grown from a small, regional security company to one of the most respected and innovative firms in the industry. Whitmore has led the industry on critical issues such as training standards, national background checks, military hiring and workplace violence prevention. He began his career in law enforcement in the early 1970s before entering the security industry. Established in 1994, the Edgar B. Watson award is given in recognition of an individual's contributions to the private security industry as a whole including their superior leadership, commitment to higher standards, advocacy for increased positive awareness and valor in their duties as a security representative. Colonel Edgar B. Watson served in the private security community for 35 years at Security Forces Inc. in Charlotte, NC, and served with NASCO for 14 years. The National Association of Security Companies (NASCO) is the nation's largest contract security industry association, representing private security companies that employ more than 250,000 of the nation's most highly trained security officers servicing every business sector. NASCO is leading efforts to set meaningful standards for the private security industry and security officers by monitoring state and federal legislation and regulations affecting the quality and effectiveness of private security services. For more information, visit www.nasco.org. AlliedBarton Security Services is the industry's premier provider of highly trained, responsive security personnel. Client-focused security officers and managers located across the country are supported by national resources developed from over 50 years of security experience. More than 55,000 employees and 120 offices provide security for several thousand clients in many industries, including approximately 200 Fortune 500 companies. As the most honored security officer services company, AlliedBarton leads the industry in award-winning programs. AlliedBarton has been recognized by Training magazine, ASTD, Corporate University Xchange, Leadership Excellence and the American Business Awards, among others. For more information call 1.866.825.5433 or visit www.AlliedBarton.com. Bill Whitmore, President & CEO, AlliedBarton Security Services accepts the Edgar B. Watson Award at NASCO Annual Private Security Breakfast. 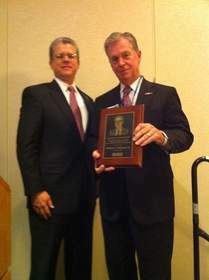 Pictured (right) David Buckman, EVP and General Counsel, AlliedBarton, and Bill Whitmore (left).